Origin: Satanic leaftail geckos are native to the tropical forests of eastern Madagascar. Where to buy: Wild caught satanics can be purchased online, at reptile shows, and perhaps on rare occasions at a local reptile/pet shop. Pricing: Recently, these geckos have been selling at an average price of about $100 to $150 each. It is still possible to find prices as low as $75, or maybe even slightly lower. Captive bred individuals are not offered often, but will sell at prices of approximately $200 each. Size: The average adult satanic is a very small gecko, reaching approximately 4.4 inches total length, snout-vent length being approximately 2.2 to 2.8 inches. Well-fed individuals will be around 6 to 7 grams in weight, with gravid females being 1-2 grams heavier. Adult males tend to be slightly slimmer than adult females. Hatchlings will be approximately 1.5 inches total length, and about 1 inch snout-vent length. A freshly hatched individual will weigh in at approximately 0.5 grams. Sexing: The most obvious characteristic of males is their hemipenal bulge, present at the base of the tail. Most often, the geckos offered for sale are at least sexually mature, so this method of sexing individuals should be most reliable. Enclosure: For a pair of these geckos, a 10 gallon (50cm x 25cm x 30cm) tank is recommended for the minimum. For a trio, I recommend a 15 gallon (50cm x 25cm x 40 cm) tall enclosure, or larger. For even larger groups of these geckos, I would recommend at least 10 gallons of space per pair of geckos. Lighting: Fluorescent bulbs are your best choice for lighting on these geckos. They emit little heat. UV light is optional. Both coil and strip fluorescent bulbs are acceptable. Plants/Cage Furnishings: I highly recommend using live plants in the enclosure. Ficus trees, pothos and philodendron vines, among other plants are perfectly acceptable and easy to buy at local stores. The enclosure should not be absolutely packed with plants. Provide some dense areas of foliage, along with open spaces between, above, and below the plants for the geckos to seek prey and move or jump about. Also provide sticks as the geckos will tend to crawl around on these at night, along with the plants, and they will also perch on these as they sleep during the day. Substrate: Basically anything that can hold water/humidity is a good choice. Avoid substrates like potting soils which can have fertilizers and materials such as perlite than can cause impaction in the gecko. Peat moss, Eco-earth, coco fiber, etc. are common substrates used for these geckos. Temperature: Care should be taken not to allow the temperature in your gecko’s enclosure to reach or go past 80 degrees Fahrenheit. A recommended year-round temperature of 72 degrees F (22 degrees C) will ensure a healthy environment for your gecko. For breeding purposes, a drop to around 65 degrees F (18 degrees C) in the winter will “cool” your geckos and perhaps prepare them to start breeding. Humidity: Most people recommend keeping relatively high humidity levels in your enclosure (which is more easily accomplished by using live plants and a moisture-holding substrate). Humidity levels can be kept in the 75-100% range, although at times mold becomes a problem with the high humidity and low temperatures. For this reason, I recommend giving the enclosure a heavy spraying at night so all surfaces become wet (except the substrate, which should not be kept damp). The geckos will drink from the surface of the foliage, and the evaporation will raise humidity levels. It is important to do this after lights are turned off, for the geckos will not be active at daytime, and will not have any water left to drink if sprayed in the daytime. Feeding: Crickets are the prey of choice, although various small roaches, pill bugs, and snails are acceptable alternatives. All prey items should be appropriately sized. Even for full-sized adult satanics, adult crickets can be too large. ½ grown crickets are often the best choice for full-sized adult satanics. About 2-3 crickets per gecko should be sufficient if fed every 2-3 days. Diet Supplements: There are many choices for diet supplements available. One of the most widely used supplements in the hobby is Herptivite from Rep-Cal, but many others are available. If using UV lights, vitamin D3 should be excluded from your supplement. If not using UV light, make sure your supplement contains vitamin D3. Only a small amount of powdered supplement should be dusted onto crickets, as over-supplementation could lead to health problems. Incubation: Clutches of 2 hard-shelled eggs can be expected every 30-45 days. Incubate the eggs at room temperature on moistened perlite or vermiculite. Eggs will take approximately 90-120 days to hatch. Great care sheet, i purchased my first male last tuesday and is doing great. I am now looking for a female and was wondering if you were selling any of your Satanics at the moment. It seems you know much about the species therefore they must be getting great care! I live in Chapel Hill NC. Let me know if you have any availible... Thanks Mike!! 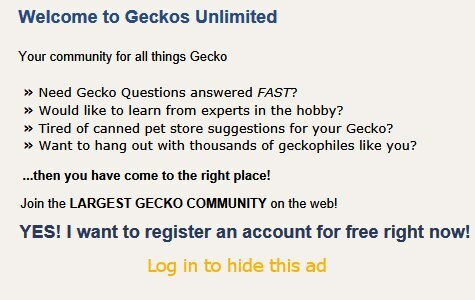 no, im not keeping geckos anymore, i just dont have the facilities for them anymore. im not even in the charlotte area anymore. best advice i can give is keep an eye out for females at the raleigh reptile show. good luck.